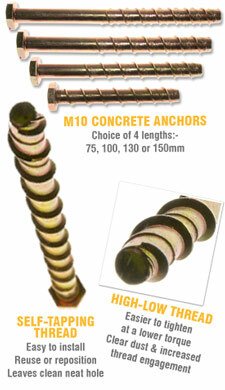 Product information "M10 Self-Tapping Concrete Anchors (5 Pack)"
Get an anchor designed for the job! 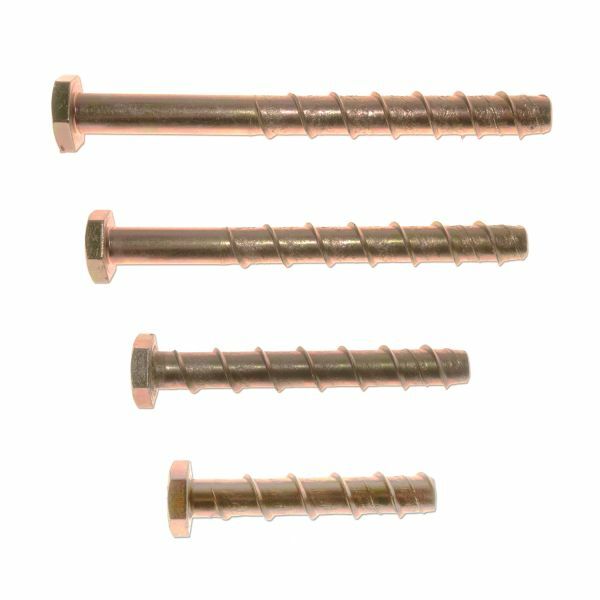 High quality Self Tapping Concrete Anchors that cut a thread directly into pre-drilled pilot holes, no anchor or plug is needed. Self Tapping Anchors are an excellent way to fasten a wide range of material to masonry. Really easy to use... just drill a pilot hole (see technical information below for appropriate diameter) and use socket wrench or spanner to tighten the screw, into concrete, natural stone, solid or perforated bricks, hollow blocks etc. The anchor has a high-low (aka hi-lo) relief thread to aid the removal of dust and ease insertion. The threaded anchor and self-tapping action allows for safe anchorage, with the substrate becoming the nut to the bolt - this utilises a tried and tested method for metals and wood to a broader selection of materials. These screws can be reversed and reused in the same hole - as it has cut the thread. Suitable for fixing timber battens/counter battening, window/door frames, machinery to the floor, wall plates, signs etc. Brackets or handrails, ducting, satellite dishes & aerials, trunking etc. In fact anywhere a fixing to concrete or masonry is required. How do I install the anchor? Quick Tip: if you do not have a depth gauge on your drill add a piece of tape onto the drill bit acting as a mark for where to stop drilling. Related links to "M10 Self-Tapping Concrete Anchors (5 Pack)"
Customer review for "M10 Self-Tapping Concrete Anchors (5 Pack)"